Vehicle sales have stalled this year, compared with their past dizzying double-digit growth. But the world’s largest car market still has considerable potential for growth that should keep it in play for the foreseeable future. Nissan car orders “starting to pick up,” executive says. With total vehicle sales up a mere 3.4% through September to 14.1 million units, compared with year-ago, and many other developing markets maintaining their momentum, it would be easy to presume China has lost its luster. But the world’s largest vehicle market still has considerable potential for growth that should keep it in play for the foreseeable future. “Other markets will undoubtedly see their vehicles grow faster than China in percentage terms, but in terms of growth in absolute numbers, not much can stand in the way of China for awhile,” Tim Dunne, director-global automotive operations for J.D. Power & Associates, tells WardsAuto. Vehicle sales in China have slowed this year compared with their dizzying double-digit growth before the global recession of 2008-2009. This mostly is due to the phasing out of government incentives, plus China’s restrictions on the number of cars that can be registered in overcrowded urban areas and the drop in export demand as Western economies struggle with recessionary pressures. That’s particularly true for the European Union, one of China’s largest trading partners. As a result, China’s own economy is softening. However, Dunne cites relatively low vehicle ownership of 50 vehicles per 1,000 Chinese, compared with 900 per 1,000 Americans, as a key reason for the country’s likely continued steady growth. “Other markets may grab some headlines in the coming years – Indonesia and Vietnam come to mind because of their large populations, underdeveloped industries and growing economies – but China will still be the central focus of most auto makers’ attention,” he says. Other analysts agree. “(China’s) continued GDP (gross domestic product) growth and urbanization increases the number of middle-class consumers that can afford to buy cars,” Bill Russo, president of consulting firm Synergistics, tells the Financial Times. Such potential encourages major auto makers such as General Motors, which has said it plans to introduce more than 60 new vehicles in China over the next five years and intends to increase annual sales in the country from 2.35 million units to 5 million by 2015. Light-vehicle sales through August, excluding imports, reached 11.7 million, WardsAuto data shows. While that’s only 6.3% ahead of prior-year’s 11.0 million, it’s 9.5 million more than were delivered in India, which was up 12.0% in the first eight months. Thailand’s sales surged 47.6% in the period to 861,951 thanks to a strong recovery from last year’s floods, but its volume is hardly in China’s ballpark. WardsAuto is forecasting China’s total vehicle sales to grow 5.5% to 19.5 million units for the year, an “astounding number any way you slice it,” Dunne says. But while the news is good, the vehicle mix is changing. Despite government efforts to boost domestic brands, Chinese car buyers still are flocking to foreign models, albeit many that are built by global auto makers in the country through joint ventures. This remaking of the market could have a lasting influence. Domestic car companies have taken a bigger hit from the market’s slowdown, Dunne says. Unable to stock dealer lots with as much inventory as their foreign-brand competitors or slash prices on vehicles due to traditionally razor-thin profit margins, deliveries have been falling. BYD is the poster child, plunging as low as 23.3% in August, while Volvo owner Zhejiang Geely is the exception, with sales still growing. Losses could go on indefinitely, he says, so long as local governments, the source of most domestic auto makers’ backing, continue their financial support in order to grow jobs and tax revenue. “If you surrender the fight now, it will become very difficult to restart it later, as competitors will have become stronger,” Dunne says of provincial governments’ possible reasoning. For the time being, American, European and Korean competitors are the domestics’ fiercest foes, as a dispute between China and Japan over ownership of a group of uninhabited islands in the East China Sea rages on. Violent protests calling for a boycott of Japanese products have led many Japanese manufacturers to shut down their Chinese operations and close retail outlets, some of which have been damaged by arson. Domestic auto makers in partnerships with the Japanese also are being targeted. China’s Xinhua news agency reports Dongfeng, which has joint ventures with Honda and Nissan, expects a 30% decline in September-December sales, amounting to a loss of 150,000 units. Overall light-vehicle deliveries already are showing the effect, with September results down 0.3% to 1.32 million units, according to the Chinese Association of Automotive Manufacturers, while total vehicle sales slid 1.8% to 1.62 million. In comparison, Hyundai-Kia September deliveries rose 9.5% from year-ago, on track to meet the auto makers’ combined 2012 sales goal of 1.25 million units. Ford, GM and BMW also saw sales boosts. The Ford Focus was the best-selling foreign brand for the month. Dunne believes the dip in sales for Japan brands will be relatively short-lived, as Chinese car buyers consistently have shown they favor the quality and reliability long inherent in Japanese cars. Plus a prolonged lockout would harm domestic JV partners and their provincial governments. 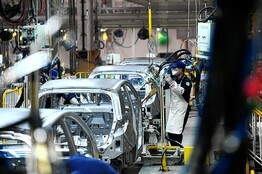 Forecaster AutomotiveCompass expects China’s light-vehicle production to reach 18.2 million units in 2012, up 6.0% from prior-year, and climb 12.6% to 20.5 million in 2013. After trailing General Motors Co. (GM) in China for eight years, Volkswagen AG (VOW) edged ahead in the third quarter, putting it one step closer to its goal of becoming the world’s biggest automaker. VW’s deliveries in the country jumped 21 percent last quarter, almost triple GM’s growth, to 704,991 vehicles, according to figures the company reported yesterday. That beat the 664,765 that GM reported earlier this month. At stake is supremacy in the world’s biggest auto market, which analysts say will likely exceed those of the U.S., Japan and Germany combined three years from now. China is the biggest market for both companies. Though the comparisons aren’t perfect -- VW counts Hong Kong and Macau and excludes trucks, while GM does the opposite - - Kevin Wale, GM China’s outgoing president, yesterday confirmed that his company had ceded the top spot for the quarter. Volkswagen declined to comment. With only one quarter left, GM’s lead of about 77,000 units may be enough for the company to hang on to the annual China sales crown. The Buick Excelle and Chevrolet Sail were the top two selling cars in China for the first nine months, while VW’s top seller, the Jetta, ranked fourth, according to the China Association of Automobile Manufacturers. VW had five of the 10 best-selling cars through September, while GM claimed three spots, according to CAAM. Volkswagen introduced new versions of its Lavida and Audi A4L sedans in the third quarter, and benefited from a territorial dispute that fueled so much anti-Japan sentiment that Toyota Motor Corp. (7203) and Nissan Motor Co. (7201) saw their September sales in China tumble the most since at least 2008. Most GM sedans were introduced two to three years ago and are reaching the end of their product life cycles, making them less attractive to car buyers, according to researcher LMC Automotive. With more refreshed models in showrooms just as Chinese buyers have turned away from Japanese brands, Volkswagen has been better able to capitalize on the tensions than GM, said Steve Man, a Nomura Holdings Inc. (8604) analyst. Volkswagen is also expanding production capacity faster -- 38 percent growth this year versus GM’s 26 percent, JPMorgan Chase & Co. (JPM) estimates. Volkswagen isn’t alone in gaining on GM. South Korea’s Hyundai Motor Co. (005380) and affiliate Kia Motors Corp. (000270) saw their combined sales rise 9.5 percent to a record in September. Ford Motor Co. (F), whose Focus compact is the No. 3 selling car in China this year, reported sales jumped 35 percent. China has helped cushion the slump in Europe, where car deliveries are headed for their biggest fall in 19 years as the region’s financial crisis continues. Volkswagen, which aims to be the world’s leading automaker by 2018, yesterday reported its biggest quarterly earnings drop since 2009 because of Europe. Though auto sales in China have slowed in recent months, the market has plenty of room to grow. Vehicle ownership in the country was equivalent to 4.7 percent of the population, versus about 51 percent in Japan and 81 percent in the U.S., according to 2009 figures from the Japan Automobile Manufacturers Association. Volkswagen in 1984 became the second foreign auto brand, after Jeep, to produce cars in China. But more recently it has trailed GM as the Detroit-based company and its Chinese partners cranked up production of Wuling minivans, which have outsold all other four-wheel vehicles in China for the past eight years. While quarterly comparisons only go back to mid-2009, annual data shows Wolfsburg, Germany-based Volkswagen hasn’t held the lead in China since 2004. Volkswagen is planning to invest 14 billion euros ($18 billion) from 2012 to 2016 in the country to regain its lead. GM said last year it planned to invest as much as $7 billion in China from 2011 to 2015. To spur sales, GM is expanding capacity and boosting production of its luxury Cadillac lineup in China, Chief Executive Officer Dan Akerson told reporters in Sao Paulo on Oct. 21. GM’s ability to fend off Volkswagen could hinge on Wuling’s minivans, which start below $5,000 and are used as both passenger-and cargo vehicles. Wuling accounts for about half of the Detroit automaker’s deliveries in China. Wuling September sales fell 2.5 percent -- more than the total market -- as the slowing economy hit demand for cheaper vehicles as less-wealthy buyers reined in spending. Speculation the government may subsidize new minivans and small cars to spur growth in rural areas has also made some buyers delay purchases, said John Zeng, director of Asian forecasting at LMC in Shanghai. While a 3.2 percent increase in Chevrolet sales helped GM avoid an overall drop, deliveries of Buicks tumbled the most since at least 2010 and Cadillac sales fell for a sixth straight month. Those brands are important to GM because they generate more than twice as much profit per car as Wuling, according to LMC. GM, which like Volkswagen has ventures with SAIC Motor Corp. (600104) and China FAW Group Corp., is adding SUVs, a category that’s been expanding about nine times faster than China’s overall auto industry. A 1.6-liter engine version of the Chevrolet Malibu, GM’s second-best selling car in the U.S. this year, has been a disappointment since it hit the market in February, said Lin Huaibin, an analyst in Shanghai with researcher IHS Global Insight. “Malibu is a disaster,” Lin said. The car was unable to effectively compete against the Superb from VW’s Skoda brand and Hyundai’s Sonata, which has sold about twice the 29,000 units GM has managed with the Malibu this year. Competition between GM and VW, the No.2 and No.3 global automakers, after Toyota, is entering a new era with both announcing in the past four months changes in the leadership of their China businesses. SHANGHAI—China's territorial spat with Japan is taking a toll on the world's No. 1 auto market, leading to its first monthly sales slump in nine months and adding to industrywide pressures that include a slowing Chinese economy and a surfeit of car factories. Associated Press Sales at Chinese auto makers could take a hit from excess production capacity. Above, workers assemble cars at the factory of BAIC Motor Corporation in Zhuzhou. China's semi-official auto-industry association said Wednesday that sales of passenger cars in China fell 0.3% in September to 1.32 million vehicles compared with a year earlier, a drop it blamed on Chinese consumers angry over Japanese claims to a group of uninhabited islands in the East China Sea. "If Japan wants economic growth, it has to maintain good relations with other Asian countries like China and South Korea," said Dong Yang, the general secretary of the China Association of Automobile Manufacturers, at a Wednesday briefing. He cited a "long-term accumulation" of resentment among consumers. Sales of Japanese brands fell sharply, according to the association's data, which came a day after major Japanese auto makers reported their individual September China sales figures. Sales of Japanese passenger vehicles in September totaled 160,000 vehicles, down 30% from August, it said, while their share of sales declined to 13.2% from 18.62%. Previously, Toyota Motor Corp. 7203.TO +1.29% said September vehicle sales fell 49% from a year earlier, while Nissan Motor Co. 7201.TO +1.88% said sales fell 35% and Honda Motor Co. 7267.TO +1.37% said sales fell 41%. Foreign as well as domestic companies picked up sales the Japanese auto makers lost, the data showed. But the overall sales slump suggested many Chinese consumers held back on purchases, in a market where more than 80% of purchases are from first-time buyers who can take as many as 15 months to settle on a model. "It's not like buying soap," said Janet Lewis, analyst with Macquarie Capital Securities Ltd. in Hong Kong. "Consumers won't immediately switch to another brand if one suddenly becomes undesirable or unavailable." That could be good news for Japanese auto makers who are counting on Chinese consumers to come back, as they did after similar bouts of diplomatic tension in 2005 and 2010. At the same time, it could add to near-term pressures in a market that once grew by double digits annually and has become a key profit center for global heavyweights such as General Motors Co. GM -0.75% and Volkswagen VOW3.XE +1.82% AG. Scott Laprise, steel and autos analyst with CLSA China, cited the potential for falling demand amid poor sentiment on China's economic prospects. He estimated dealers were holding two to three months of inventory this year compared with one month last year. Mr. Laprise estimates full-year growth in auto shipments of about 3% and real end-user demand to be even lower. Other analysts forecast higher growth such as Macquarie's 6.4%. Excess production capacity also looms on the horizon of China's car industry, especially for Chinese brands. "Their plant-capacity expansion programs far exceed their own growth in the market," said Bill Russo, founder and president of auto consulting firm Synergistics Ltd. and a former Chrysler executive. "They are going to be sitting on a lot of excess capacity that is going to make pricing and profitability much more problematic in the future." Mr. Russo and others still see long-term growth in China, especially for foreign brands and luxury brands, which enjoy a strong reputation among China's status-conscious car buyers. Yuan Qingwei, a sales consultant for a BMW AG BMW.XE -0.48% dealership in Beijing, said his dealership sold eight cars one day this week alone. "Now we can sell almost 200 cars per month," he said. "We estimated that total sales this year may reach 2,300." Chinese officials also might face pressure to rekindle sales of Japanese brands from local auto makers that make Japanese cars through joint ventures, as well as local officials in their areas worried about growth. Mr. Dong, of the China auto association, cited local media reports that policy makers could soon offer subsidies for rural car buyers to help pick up the market, though he didn't offer details. "Some Chinese car makers who have joint ventures with Japanese auto makers told me that they respect the choice of some customers not to buy Japanese cars," Mr. Dong said. Domestic brands, which have taken hits in recent months as economic growth has slowed, won an unexpected gain from the Japanese slump. Sales rose 27% in September from August to 561,900 vehicles. U.S. auto makers' sales rose 12% to 168,200, while German auto sales fell slightly to 253,700. Also on Wednesday, Ford Motor Co. F +1.70% said it sold 59,570 vehicles in the country in September, up 35% from a year earlier. GM said Tuesday that it sold 244,266 vehicles in China in September, up 1.7% from a year earlier. —Yajun Zhang and Kersten Zhang in Beijing contributed to this article. A version of this article appeared October 11, 2012, on page B3 in the U.S. edition of The Wall Street Journal, with the headline: Japan Spat Hurts China Car Sales.